Loving tattoos doesn’t mean that you have to cover your body with tattoos. You can enjoy the culture of tattoos by appreciating other people’s tattoos and keeping up with tattoo designers in a tattoo magazine. Some of the best magazines also cover music, studio, and designer articles. A subscription allows you to enjoy the world of tattoo culture without spending all your time at the studio. You can get a sense of tattoo culture internationally an at home. Keep up with the best in tattoos with a great magazine like Inked, Tattoo, or Skin & Ink. Inked is a tattoo magazine that also focuses on culture, art, style, and music. They feature tattoo art and design. They follow celebrities who have tattoos as well. They have regular articles on musicians, women with tattoos, fashion and tattoos, events, and causes supported by tattooing. They have galleries of tattoo designs in each magazine. 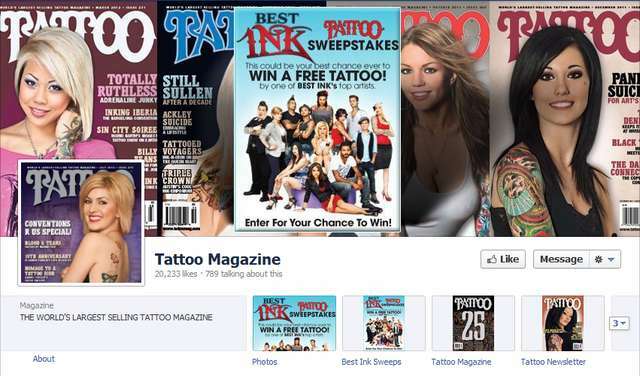 They also have a separate publication especially for women interested in tattoos called Inked Girls. Online they have a store, forums, and spots on tattoo artists. They feature an Inked Girl of the Day each day on their website as well. They also have a television channel. Tattoo Magazine is publication that is strictly dedicated to tattoo art. It features studios that do fine work and people who have some of the most beautiful artwork on their bodies. It is a tasteful magazine that takes tattoos seriously as an art form and treats it with respect. They occasionally follow celebrities with tattoos. They also have features on tattoo cultures throughout the world and some stories on the history of tattooing. One of their unique elements is their focus on tattoo studios and their work. High class studios that are known for their fine work get spreads in this magazine. Skin & Ink is a tattoo magazine that focuses on tradition and international tattoo. They especially cover events and news in the tattoo industry. They give special attention to tattoo artists from around the world and conventions held worldwide. They keep up a conversation on the history and future of tattoo art. They keep readers aware of upcoming events in the tattoo world and do special coverage of events that have taken place. Their website features more of the best with additional photos of conventions and access to past issues of the magazine. This is a great magazine to see some really beautiful tattoo art.